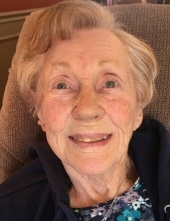 Our dear mother, grandmother and great-grandmother was born November 11, 1932 in Salt Lake City, Utah to Gerard Doezie and Ardiena Van Beezoyen Doezie, and passed away peacefully on April 10, 2019 in Loa, Utah. Growing up in the Salt Lake City avenues, she had a loving home, but life wasn’t easy for them during the depression. She began working days and attended school at West High in the evenings in order to help her family financially. She was able graduate with her East High class of 1951. Always industrious, she a hard-worker throughout her life. Toni was a gifted cross stitcher and made many beautiful tablecloths and pillow cases.Being left-handed, however, she never learned to crochet like her mother, which she regretted. Toni met the love of her life, George Arvin Brinkerhoff, at Fishlake, Utah during the summer of 1952. They married June 6, 1953 in Las Vegas, Nevada. Their marriage was later solemized in the Jordan River LDS Temple. George passed away September 29, 2016 in Salt Lake City, Utah. During their marriage, she and George took the family in their camper on weekend boating and camping outings most every weekend. They gave their children the best childhoods possible. They took great pride in their yard. By example, they taught their children the importance of hard work, keeping your word, and being on time. The family clock was set ahead five minutes. After Toni’s retirement working for the Alcohol Beverage Commission, she and her George “enjoyed the life” and spent their time wintering in St. George, Utah and Casa Grande, Arizona, and made many friends. They traveled with the “Temple Riders” motorcycle group throughout the United States, and later served a Service Mission at Welfare Square for the Church of Jesus Christ of Latter Day Saints. Survivors include: daughters Diena Ann (Michael) Riddle, Bicknell, Utah and Annette (Trent) Bringhurst, Murray, Utah; son George Robert (Tracie) Brinkerhoff, Heber City, Utah; sister Linda Ann Robertson (Robert) Lake, Springville, Virginia; and brother Scott Robert (Susie) Robertson, Scottsdale, Arizona. She leaves behind ten loving grandchildren, and 19 1/2 beautiful great-grandchildren. She is preceded in death by her husband, George Arvin Brinkerhoff; Parents Ardiena Van Beezoyen Doezie Robertson and Gerard Doezie; step-father Scott Finch Robertson; sister Ardiena Joy Doezie Wadsworth; brothers Gerard David Doezie and Sterling Isaac Robertson. Graveside services for family will be held on April 13, 2019 at the Bicknell Cemetery, Bicknell, Utah, under the direction of Springer-Turner, Richfield, Utah. The family wishes to thank Ryan Denison and staff at Serenity Springs/Beehive House (Loa, Utah) for their kindness and dedication to our mother. In lieu of flowers, please consider donations to Color Country Animal Welfare (Torrey, Utah) or Serenity Springs/Beehive House (Loa, Utah) in Toni’s name. To send flowers or a remembrance gift to the family of Toni Brinkerhoff, please visit our Tribute Store. "Email Address" would like to share the life celebration of Toni Brinkerhoff. Click on the "link" to go to share a favorite memory or leave a condolence message for the family.